A repair kit comprising 2 replacement gears for the housing mounted within the instrument cluster assembly. You need to remove the insturment cluster from the car and dismantle it to install these parts. They are mounted at the end of the odometer unit, and the smaller gear being the most common failure. Detailed installation instructions can be easily found by searching for "Volvo Odometer Gear Repair" online. 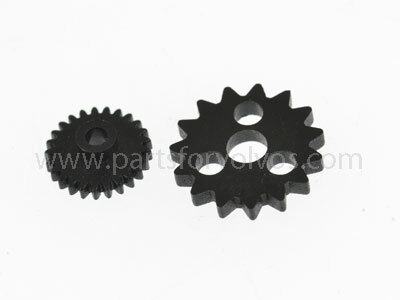 The smaller gear has 25 teeth and is 10.25mm diameter, and the larger gear has 15 teeth and is 15mm in diameter. The larger gear is mounted behind the white gear housing containing the smaller gear, when the unit is removed from the car. We strongly advise to review the instructions available online, and have a clean worksurface to use before beginning to strip down the instrument unit and internal components are delicate and easily misplaced! VDO cluster (correct type for this kit) has the trip mileage displayed as 3 digits in the same window and the 4th on its own. Yazaki cluster (this kit will not fit) has the trip mileage as the 4 digits in 4 seperate windows.